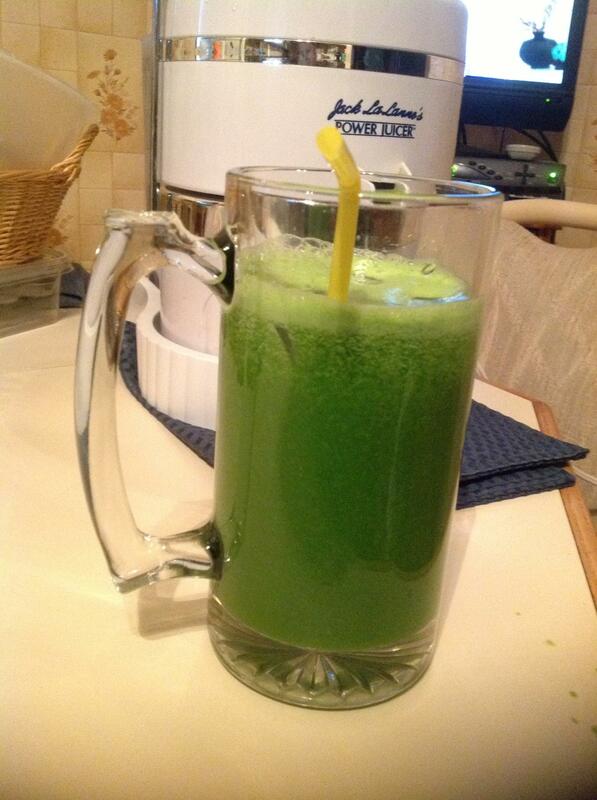 One thing I have picked up on is juicing. 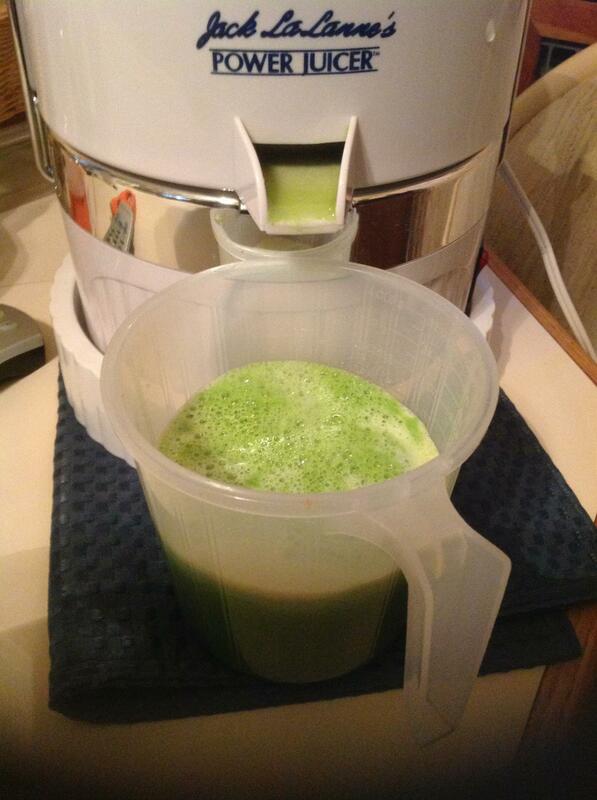 I have always been familiar with juicing from its references in the health sphere, my aunt’s dietary change during her chemo treatments, and now (most famously) through Dr. Oz and the peddling of his green drink. 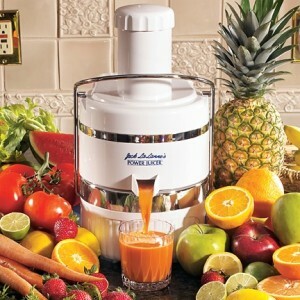 After my aunt’s passing, my dad inherited her Jack LaLanne juicer and it sat, collecting dust, in my dining room for years. 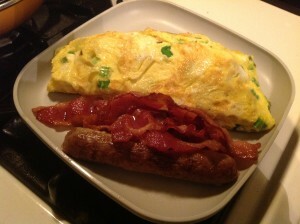 During my period of unemployment, breakfast was never a worry for me because I had all the time in the world to make eggs, omelets, bacon, etc. every morning. However, once I started working again breakfast became a luxury I didn’t always have time to enjoy. I usually drink a protein shake within 30 minutes of getting up to jump-start my metabolism, but that isn’t enough to keep me satiated until lunchtime. 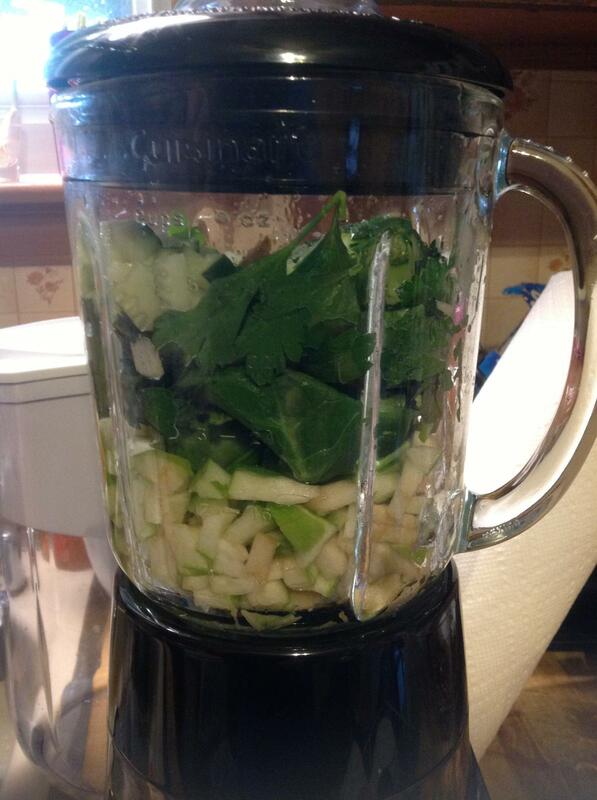 So after watching Fat, Sick & Nearly Dead I decided to start juicing. While I strongly believe I won’t be able to survive on juice alone, I decided to begin juicing for breakfast to get a burst of energy, ingest great nutrients, and have something quick and easy that I can drink on the run. Turns out juicing is not only quick and easy, but extremely delicious and filling! 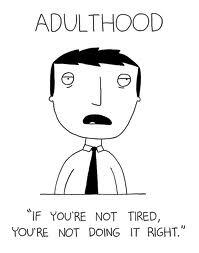 I noticed that mornings when I don’t juice leave my energy levels low. 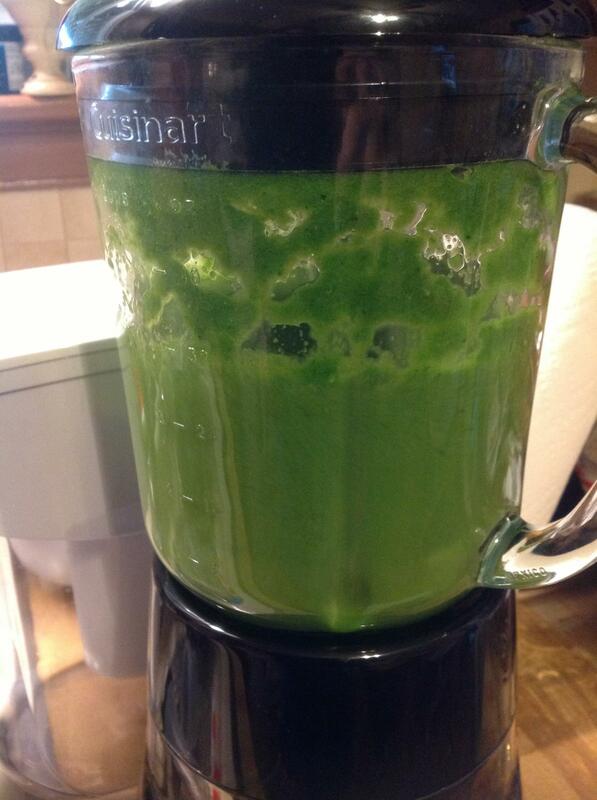 The great thing about juicing is that it gives you all benefits of a filling meal while squeezing into a little cup! I admit, juicing can become very costly – the cost of a juicer alone can run you hundreds – but if you have access to a juicer and an inexpensive farmer’s market, juicing for at least one meal per day is extremely doable. Here are some recipes I have tried and documented (there have been many more undocumented recipes, but these are really the memorable ones). If you are a fan of V-8 or Bloody Mary’s, this juice is for you. More like a spicy gazpacho, this juice would be classified as a dinner juice. I followed the recipe here for the exact ingredient list and amounts and mother of god this made A LOT of juice! I begrudgingly drank it all down, though a straw, and felt like death afterwards. My advice? If you make this, you need to quarter the recipe (at least!). 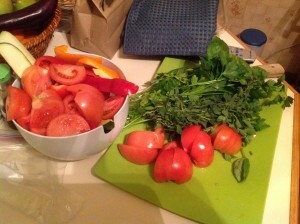 It is very spicy from the raw onions and has a salsa/gazpacho taste. 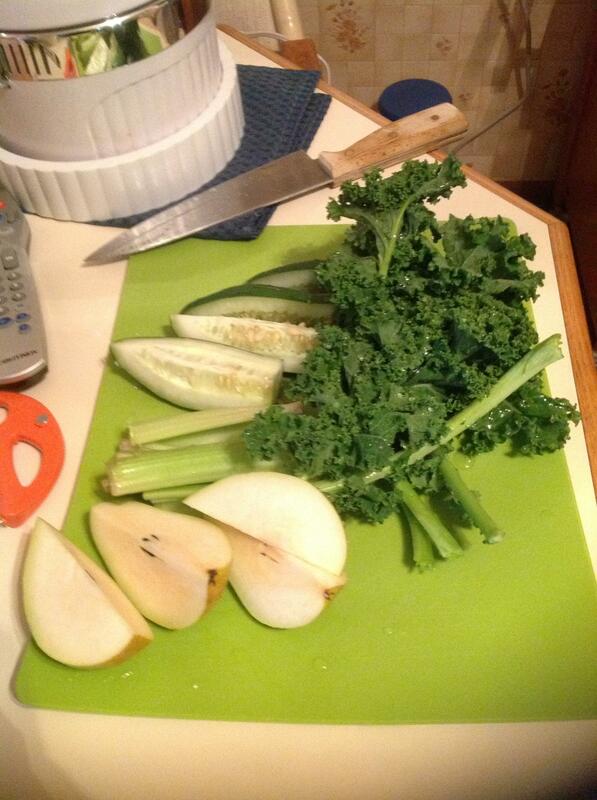 Be sure to run the kale through the juicer first because it tends to have less juice and get stuck. I put in the kale and immediately follow with the cucumber because of its high juice content so the juicer will not jam. My recipe yields about 2 cups of juice. I prefer to add a few ice cubes and use a straw to drink the juice quickly before I leave for work, or I pour the juice in a blender ball cup with some ice to drink on the go. The good thing about the blender ball cup is that it easily mixes the juice as it begins to separate. 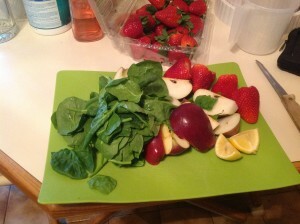 Other variations include using 2 apples instead of 1 pear and 1 apple. If you want to be a little naughty and don’t care about your sugar intake from fruit, a really delicious combination is to use a fuji apple and a golden delicious apple. Absolutely delightful and refreshing. Be sure to put the spinach through first and then follow with the apples so the apple juice can help the spinach get through the juicer without causing any harm. Also, it is imperative that you peel your lemon because the thickness of the rind may damage your juicer’s blades. 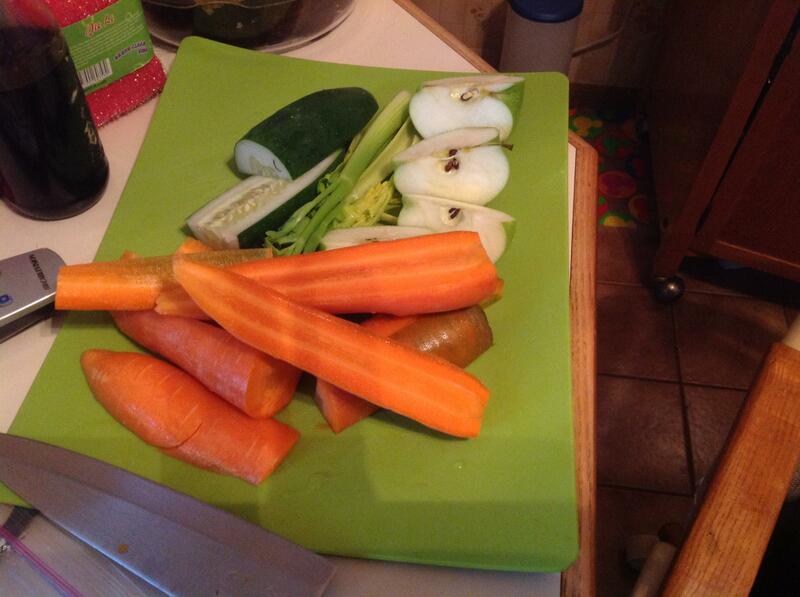 Another variation of my Morning Green Juice is the Green Carrot Juice. 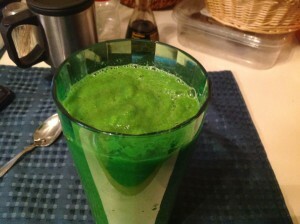 Using the same recipe as the Green Morning Juice, simply substitute one apple/pear and the kale for a few large carrots. Whoa. Serious stuff there. Am I the only one convinced it wouldn’t blend? Anyway, onward to Dr. Oz’s famous Green Drink! Because this was my first time making this kind of drink in my blender, I chopped my ingredients into tiny pieces for easier blending. This was a good idea, but it took a while for it to break up. This consistency literally took about 4-5 minutes of blending on high and a lot of fear that my blender would explode on my kitchen counter. The product is going to be kind of baby food-ish, but it is drinkable! Here is the result. I tried using a straw, but as you can see I surrendered and used a spoon. Though this does make a large amount, the flavor is nice and has a slight sweetness to it. So what do you say, try a juice! To make it a little more exciting for you, check out my juicing/smoothie board on Pinterest to get some more ideas on how to make the most out of your on-the-go breakfast! Thanks for stopping by and remember to practice some Aloha today!